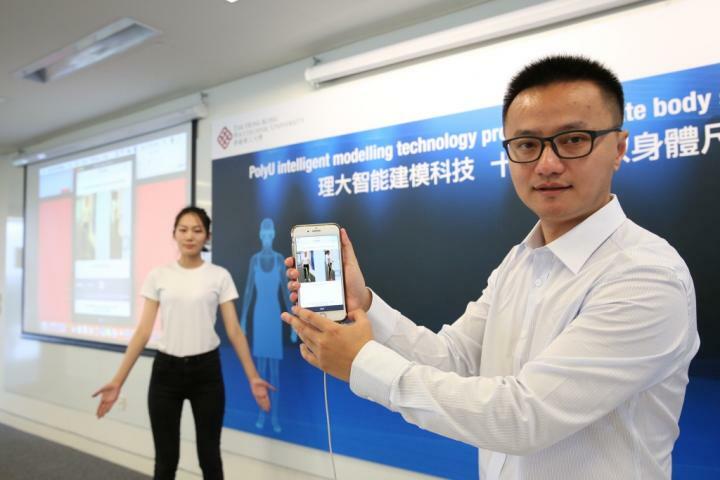 Shopping well-fitting clothes online or making bespoke garments can be done more easily with the intelligent 3D human modelling technology developed by The Hong Kong Polytechnic University (PolyU), which digitally reconstructs the shape and size of a person accurately from two full body photographs within 5-10 seconds. With online shopping gaining popularity, this PolyU innovation, developed by Dr Tracy P.Y. Mok, Associate Professor from the Institute of Textiles and Clothing at PolyU, and Dr Zhu Shuaiyin, PhD graduate of the same institute, can solve the ill-fitting problem and enhance the online shopping experience. Existing methods to achieve automatic shape modeling and dynamic poses deformation, including scan-based, image-based and example-based have known limitations. They involve expensive and bulky scanners and too much approximation, and therefore are of questionable accuracy. By integrating cutting-edge computer graphic and vision technology, this innovation allows a customised model in arbitrary dynamic poses to be created automatically within 5-10 seconds. The system can reconstruct the 3D shape and extract over 50 size measurements of different parts of a person, including the girth of bust, waist, hip, thigh, knee, calf and neck, as well as arm length, shoulder slope accurately. The discrepancies in tight-fitting and loose-fitting clothing are less than 1cm and 2cm respectively, which are precise enough to fulfil the specific requirements of the clothing industry for fashion applications and comparable to body scans. These methods are enabled by "big data analytics" where a large dataset with over 10,000 human scan models were used to analyse local 3D shape features and predict under-the-clothes body profiles. Different from other existing methods where 3D scans were analysed globally, PolyU's research team decomposes the data yielded from 3D scan into local features for data analysis. The team then predicts and assembles the 2D and 3D shapes of subjects based on 2D photographs. The resulting 3D models have precisely reconstructed both global and local shape characteristics of individuals, and accurate body measurements can be extracted from these customised models. The digital reconstruction of human subjects can provide competitive advantages for the fashion industry. "With an accurate projection of the size and shape of the human body, these customised models will enhance online shopping experience, and stimulate growth in fashion online shopping," said Dr Mok. "The output models can also enable customers to visualise try-on effects before purchases in online stores. This frees us from the limitations imposed by taking body measurements physically, helping customers to select the right size in online clothing purchases," added Dr Zhu. With the support from Shanghai Technology Entrepreneurship Foundation-PolyU China Entrepreneurship Fund, Dr Zhu has set up the start-up, TOZI, in Shenzhen in 2017 to commercialise and further develop the 3D human modelling technology, echoing PolyU's commitment to foster culture that boosts entrepreneurship and inspires entrepreneurs. Based on the intelligent 3D human modelling technology, TOZI has collaborated with "Industry 4.0" factories to launch a brand-new customer-to-manufacturer (C2M) service for customers. It brings unmatched online shopping experience to end users by empowering them to order tailor-made clothing within just three minutes anywhere anytime. By a few clicks on smartphones, customers can measure their own shape and size, and order tailored made shirts, with a range of fabrics, collars, pockets, cuffs, front plackets to choose from.